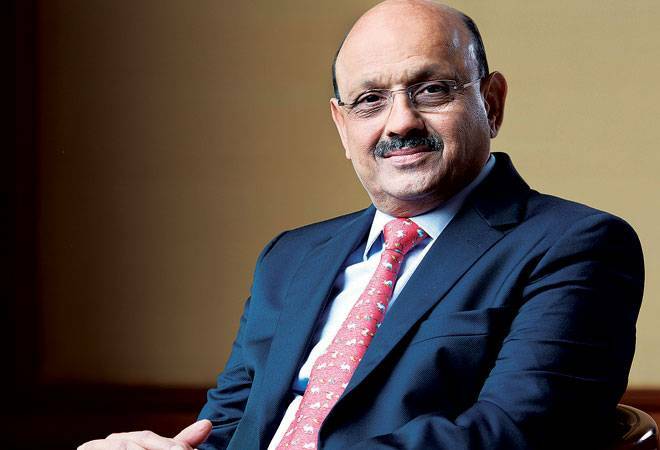 Indo Count Industries went into corporate debt restructuring in 2008; today, the company has roared back into business, and is one of the most valuable companies in India. Five years ago, Warren Buffett, the world's biggest investor, had said his worst investment was the textile mill that went by the name Berkshire Hathaway. It was a name that he famously used to invest in several other businesses, although he closed the mill after a while. But if Buffett had encountered Indo Count Industries, he would probably have changed his mind about textiles. In the past 18 months, the share price of the home textile company has jumped 20-fold, from Rs 44 per share in April 2014 to over Rs 900 in October 2015. And if you think it's just a stock thing, well, it's not. In the past five years, the company, which makes bedsheets for exports, has demonstrated strong all-round performance. On a standalone basis, its top line grew from Rs 666 crore in 2010/11 to Rs 1,680 crore in 2014/15. In the same period, its net profit rose from Rs 9 crore to Rs 139 crore. Among its peers, it has the highest return on capital employed and the lowest debt to equity ratio (see Magic Numbers). This, after it got itself into a mess in 2008, which resulted in the company going in for a corporate debt restructuring (CDR) exercise, which it got out of in March 2015, four years ahead of schedule. 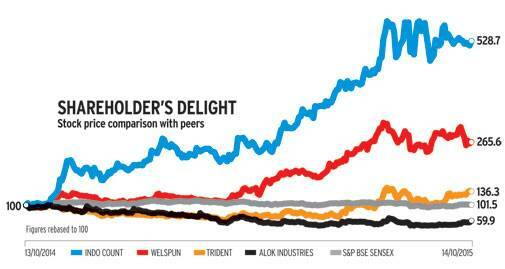 No wonder investors have been left enamoured. The stock's performance has also meant that Indo Count Industries has made a comeback into the exalted BT 500 after 22 long years. It had the biggest jump in ranking - by 511 places to rank 366 in the pecking order, thanks to an almost 650 per cent jump in average market capitalisation - April to September 2015 - to Rs 2,748 crore, compared to Rs 350 crore in 2014. The journey to reach the top 500 companies wasn't easy for Indo Count Industries. In August 2008, it had to go in for CDR following a Rs 150-crore loss on account of a forward derivative contract - at that time, its revenue was Rs 290 crore. "It was a mistake, and we had to pay a huge price for it," says R. Sundaram, CFO and Company Secretary. "When the rupee was at Rs 41 per dollar, we took a forward contract that the rupee would appreciate to Rs 35 per dollar, but it went to Rs 55 per dollar. Due to the huge currency loss, our debt to equity was close to 1:8." Adds Anil Kumar Jain, Chairman and Managing Director of Indo Count Industries: "We were left with two options - survive or suicide. Rather than fighting with the banks that got us into trouble due to the currency loss, we decided to get back strongly and grow the business such that today, without taking a haircut, we have repaid every penny to the banks." What helped was that the company had sowed the seeds for growth before the 2008 crisis. In 2006, it entered the home textile business - earlier, it was into spinning and exporting yarn and in consumer durables - triggered by the US ending its quota regime in 2005. Today, home textiles account for 81 per cent of its revenues. "Strategy of forward integration into home textile has been the game changer for Indo Count Industries," says Rajesh Kothari, Managing Director of AlfAccurate Advisors, who has been an investor in Indo Count Industries since last October. 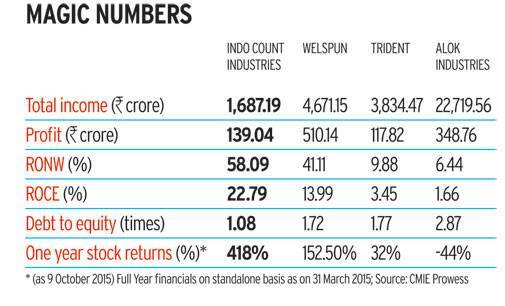 "Unlike its peers (Alok Industries and Welspun) that went for backward integration, Indo Count Industries remained asset light, which has helped them record impressive returns on their capital employed." The company focused on investing in processing capacities and outsourced two-thirds of its spinning and weaving activity. 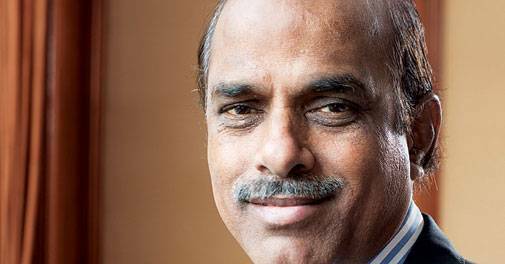 "This was a conscious strategy and probably we will be the only company in the world to adopt such a model," says Anil Kumar Jain. Adds Manish Bhandari, Managing Director of Vallum Capital Advisors, "There are three reasons why the stock of Indo Count Industries was attractive and a buy. First, the business revival due to the shift in dynamics from China to India in the home textile business; second, the declining raw material prices of cotton; and third, the under utilisation of capacity of the company." 'It was a mistake, and we paid a huge price for it. When the rupee was at Rs 41, we took a forward contract for Rs 35, but it went to Rs 55 per dollar. The huge currency loss, led to huge losses for us,' says R Sundaram, CFO & Company Secretary, Indo Count Industries. In the past year, the company has expanded its addressable market from $4 billion to $13 billion in the US by diversifying into new products like fashion bedding, institutional linen and utility bedding. "Going ahead, the new product segment will account for 25 per cent of the growth in the company," says Mohit Jain, promoter at Indo Count Industries. Apart from diversifying its product range, the company is also spreading its wings to Europe and Australia. Today, the US accounts for 70 per cent of its revenues, which Jain wants to bring down to 50 per cent in four to five years. "We have already opened offices in Manchester and Melbourne," he says. "We plan to open an office in Dubai to cater to the Middle East and North Africa region (MENA) region." Anticipating further growth, the company plans to expand capacity at its existing Kolhapur plant, from 68 million metres to around 100 to 110 million metres over the next two years. And, while Mohit Jain agrees that the rise in cotton prices and rupee appreciation are risks, he says he can handle them. Says K.K. Lalpuria, Executive Director at Indo Count Industries: "Rise in raw material prices, slowdown in the US market and rupee appreciation will hit everyone. Consider margins coming down by 10 per cent for everyone, we will still be profitable." CFO Sundaram has the last word when he says, so long as people prefer to sleep in beds, Indo Count Industries will be in business. Well, that's not something we're arguing with.